A few months ago, I received an email from Simon Malone, the founder of a new health drink called Ka’Chava, asking me to try his new drink and see what I thought. I decided to give it a try because I liked what I saw on the ingredient list. The ingredients were very clean and natural, containing many superfoods, such as, acai berry, spinach, kale, broccoli and shitake mushrooms to name a few. Plus his health drink contained no preservatives, artificial sweeteners, flavors, colors, dairy, soy or gluten and was filled with mainly organic ingredients. With the ingredient list having passed my rigorous review, it was on to the taste test. 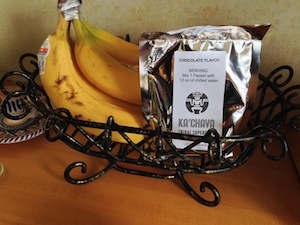 Simon sent me two flavors that Ka’Chava is currently selling: Chocolate and Vanilla. I shared them both with my 3 and 6 year old boys, because kids tend to be pickier eaters, especially when it comes to fruits and vegetables. So, if it could pass their taste buds, then it would be a winner. What does “Ka’Chava” have going for it? The “Ka’Chava” health drink passed the taste test for all of us. Both of my kids kept asking for more well after their initial tastes. So, if you have picky eaters who refuse to eat vegetables and fruit, this might be another way to get them to eat them. Also, unlike other health drinks, you will not find added sugar, corn-syrup, saturated fat or a list of unpronounceable ingredients that look like they they belong in a science textbook. Instead, you will find a drink that is nutrient rich and loaded with high end organic ingredients that are known for their anti-oxidant or digestive properties and that can provide you with increased energy. Each of the two flavors that Ka’Chava sells are around 200 calories, with 24 grams of protein and 8-9 grams of dietary fiber per serving. So far, so good. What’s the catch? If you are thinking about using Ka’Chava as a meal replacement it may not be enough calories to do that effectively, especially if you are on a 1800 to 2000 calorie diet. At around 200 calories a drink, I see it more as a healthy mid day or late night snack to help improve a poor diet, to use before or after a workout or as a protein boost to help build your muscles after a hard strength training workout. Plus, at about $70 for a container which equates to 15 drinks they aren’t that cheap. It is a little more than $4.60 a drink. So, while it is a healthy drink made with clean and nutritious ingredients that many would love to try, it may not be easy to afford for those with tight budgets. If you are searching for an easy, healthy snack that will give you energy, nutrition and curb your munchies, this snack will fill those needs. And it is definitely a healthier snack to give to your kids than a candy bar or most energy drinks that tend to be filled with sugar. I know my 3 year old loved this drink. I’d choose this drink for him over cookies and crackers any day. So, if you find yourself reaching for that candy in the employee break room at around 3:00pm, try Ka’Chava instead. After all, it is tasty and good for you, too! It looks good but a little pricy for a snack.